Also serving communities of Bay Saint Louis. There are 5 Assisted Living Facilities in the Gulfport area, with 2 in Gulfport and 3 nearby. To help you with your search, browse the 41 reviews below for assisted living facilities in Gulfport. On average, consumers rate assisted living in Gulfport 3.5 out of 5 stars. Better rated regions include Biloxi with an average rating of 4.1 out of 5 stars. Caring.com has helped thousands of families find high-quality senior care. To speak with one of our Family Advisors about assisted living options and costs in Gulfport, call (855) 863-8283. Gulfport is a coastal city located along the Gulf of Mexico. The city is well-known for its long beaches, beautiful views and marine life such as seals and dolphins that are visible from its shoreline. Gulfport is a medium-sized city with a population just above 70,000 residents; 13.5 percent are seniors over the age of 65. The Gulfport area is home to eight assisted living facilities for seniors in need of some assistance with activities of daily living. Two of these are located directly in the city while the remaining six are nearby in Ocean Springs, Biloxi and Saint Louis. 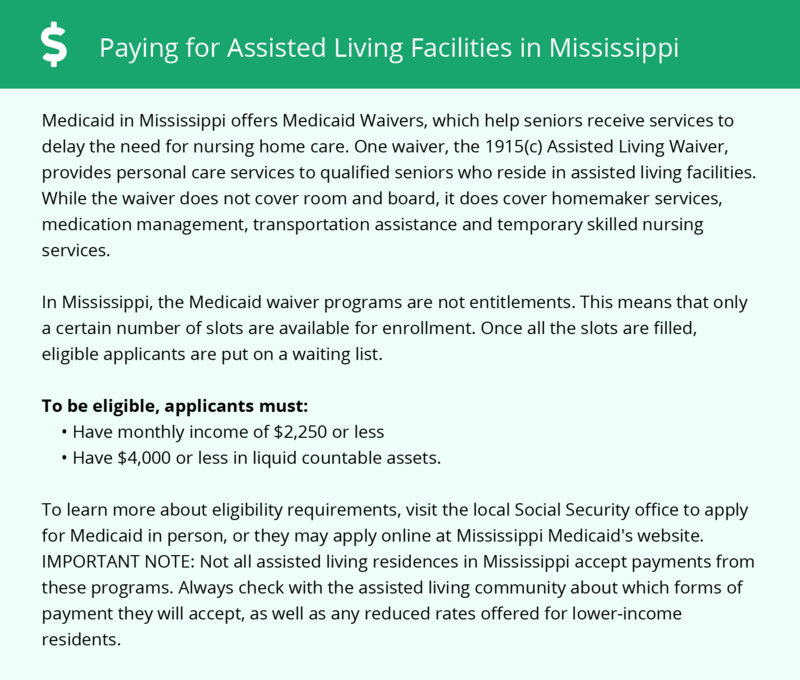 Assisted living is licensed and regulated by the Mississippi Department of Health, Health Facilities Licensure and Certification throughout the state. The Gulfport area is home to world-class medical facilities, including Memorial Hospital at Gulfport, in case of medical emergencies or illness. Gulfport has plenty of arts and cultural venues, including Jones Park or The Lynn Meadows Discovery Center. Coast Transit offers safe transportation options to seniors and other residents throughout Gulfport and surrounding areas. Reduced fares are available to seniors over 60 years of age, and the service is free for those over 90. Seniors living in Gulfport may want to inquire about security in their assisted living facilities. Property crime rates are nearly double the state average. 52.97 property crimes occur annually per 1,000 residents, while the state average is only 27.68 per 1,000 residents. The climate in Gulfport is very hot and humid and the city is frequently in the path of hurricanes. The average high temperature in July is 90 degrees, and the city sees an average of 64.3 inches of rainfall each year. By comparison, the U.S. average is 39.2 inches of rainfall and a high temperature of 86.1 degrees in July. Seniors who are sensitive to heat or who are uncomfortable in extreme weather may prefer to find assisted living options elsewhere. Although the overall cost of living in Gulfport is nearly 13 percent below the U.S. average, the cost of health care is 9 percent above the U.S. average. Assisted Living costs in Gulfport start around $0 per month on average, while the nationwide average cost of assisted living is $4,000 per month, according to the latest figures from Genworth’s Cost of Care Survey. It’s important to note that assisted living rates in Gulfport and the surrounding suburbs can vary widely based on factors such as location, the level of care needed, apartment size and the types of amenities offered at each community. 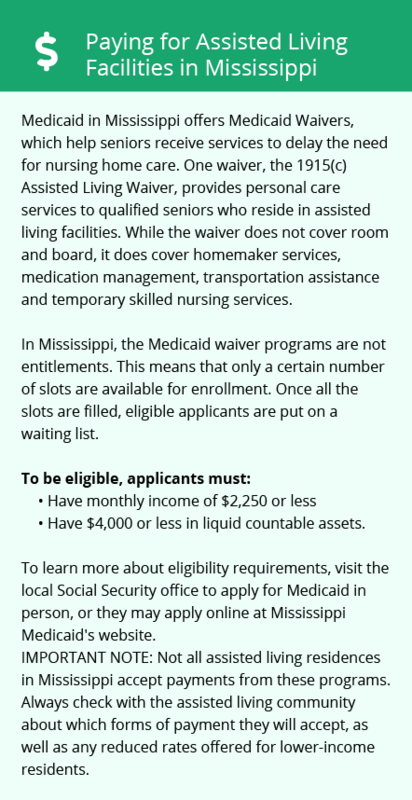 The state of Mississippi provides financial support to eligible seniors in assisted living facilities under a Medicaid 1915 (c) waiver. There is no optional supplement to Supplemental Security Income and residents of assisted living are not covered by any government programs for the cost of room and board. To see a list of free assisted living resources in Gulfport, please visit our Assisted Living in Mississippi page. Gulfport-area assisted living communities must adhere to the comprehensive set of state laws and regulations that all assisted living communities in Mississippi are required to follow. Visit our Assisted Living in Mississippi page for more information about these laws.